Are you hopping with us on the Newton's Nook Design 5th birthday blog hop? Well today a few guest and the design team are showing a ton of fun projects to celebrate the existence of Newton's Nook Design. If you completely read till the end of this post you know how you can win with placing comments or get a fun gift while shopping! 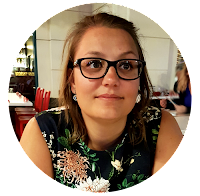 * Doe je met ons mee aan de Newton's Nook Design 5de verjaardags blog hop? Today tonen een paar gasten en het ontwerpteam een ​​hoop leuke projecten om het bestaan ​​van Newton's Nook Design te vieren. Als je helemaal tot het einde van dit bericht leest, weet je hoe je kunt winnen met het plaatsen van opmerkingen of hoe je een leuk cadeau kan krijgen tijdens het winkelen! For this birthday hop I wanted to make two fun summer birthday cards with as many Newton's Nook products as possible. * Voor deze verjaardags hop wilde ik natuurlijk twee leuke zomer verjaardagskaarten maken met zoveel mogelijk Newton's Nook producten. I first used the scalloped frame and various border dies to create a sea scene. In addition, the ice creams and all other attributes perfectly fit a summer look. * Ik gebruikte allereerst de boogjes frame en verschillende border dies om een zee scene te maken. Met Daarnaast paste de ijsjes en alle andere attributen perfect voor een zomerse look. The second card is also made with a new set ans some older items. * Het tweede kaartje is ook gemaakt met een nieuwe set gepaard met enkele oudere items. The "Tropical Leaf" stencil gives it a very nice summer feeling. The other items were chosen based on the colors and items of the new "Cat Treats" set. * De "Tropical Leaf" sjabloon geeft het een heel mooi zomergevoel. De andere items zijn gekozen op basis van de kleuren en items van de nieuwe "Cat Treats" set. Celebrate with us and enter to win! 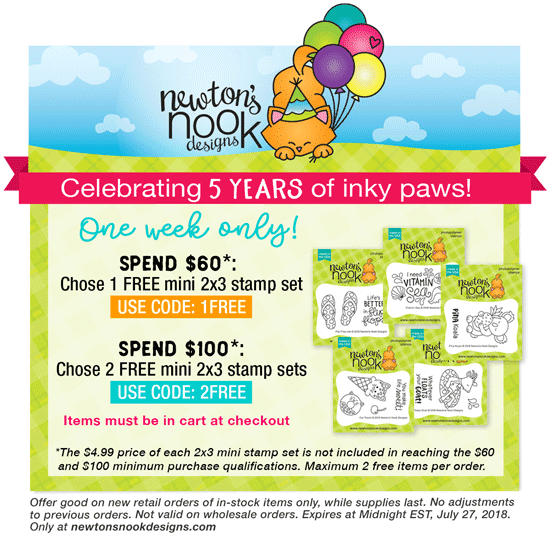 To celebrate 5 years, Newton's Nook Designs is giving away a $ 25 credit to spend in their online shop to 5 lucky winners! Here's how to win: Comment on the NND Design Team and Special Guest blogs (see list below)! The winner will be chosen from the collective blog hop posts. Make sure to check out each of their blogs and comments for your chance to win. You will not know which blog has been chosen. You have until Sunday, July 22 at 9pm EST to comment. Winners will be announced on NND blog post on Monday, July 23 and you will have to win! * Vier met ons en doe mee om te winnen! Om 5 jaar te vieren, geeft Newton's Nook Designs een cadeaubon van $ 25 weg voor hun online winkel aan 5 gelukkige winnaars! Je kan als volgt winnen: reageer op het NND Design Team en Special Guest blogs (zie onderstaande lijst)! De winnaar wordt gekozen uit een collectief aan bloghop-berichten. Zorg ervoor dat je elk van hun blogs bekijkt en een reactie achterlaat voor een kans om te winnen. Je weet niet welke blog is gekozen. Je hebt tot zondag 22 juli om 21:00 uur EST om commentaar te geven. Winnaars worden op maandag 23 juli aangekondigd op NND-blogpost en je zult moeten winnen! Wow your cards are amazing. I love all the details you put into the first one, with the layers of the background and your framing. REally nice. And your second card the background is awesome and the coloring of your elements ... wow. I love the framing on both cards alot! 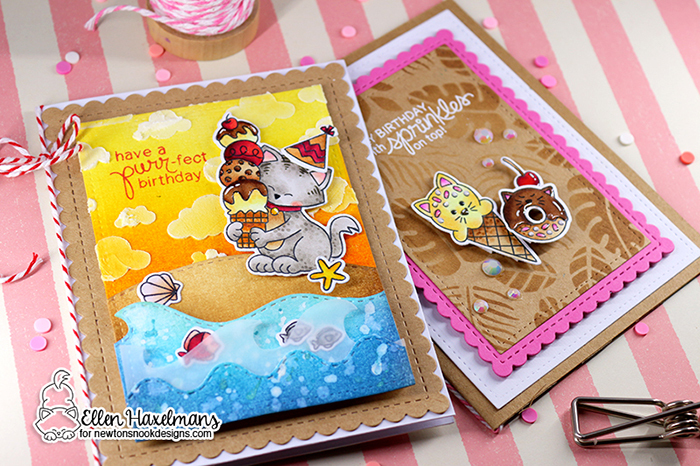 such pretty cards..love the ice cream on the beach! Ellen!!! You cards look so happy, bright and absolutely summery!!! Love all the project you made for the release week!!! Such a stunning incredible job!!! I love Newton with his stack of ice cream cones. It is so bright and summery. Love the colors! Adorable cards, love all the details! Your cards are absolutely darling! Hello Ellen! These cards are SO CUTE! 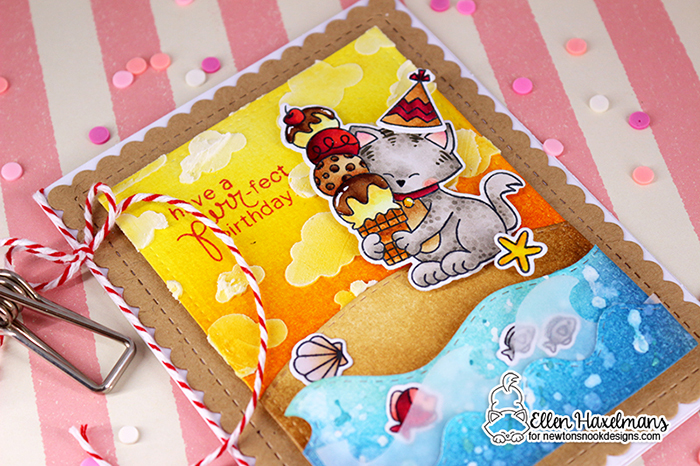 I love the kraft background with the tropical leaves stenciled on it behind the kitty shaped ice cream and donut! The kitty with his ice cream at the beach is so awesome! What a great scene! Thank you for helping us celebrate 5 years today and hopping along! your cards re the cutest cards ever! I’m loving your beautiful cards with those awesome stamp sets. These cards are full of summer fun!! Whether at the beach with Newton enjoying ice cream while watching the fish play in the water or sitting beneath palm branches and some "cat approved" desserts, the days are for memory-making relaxation!! 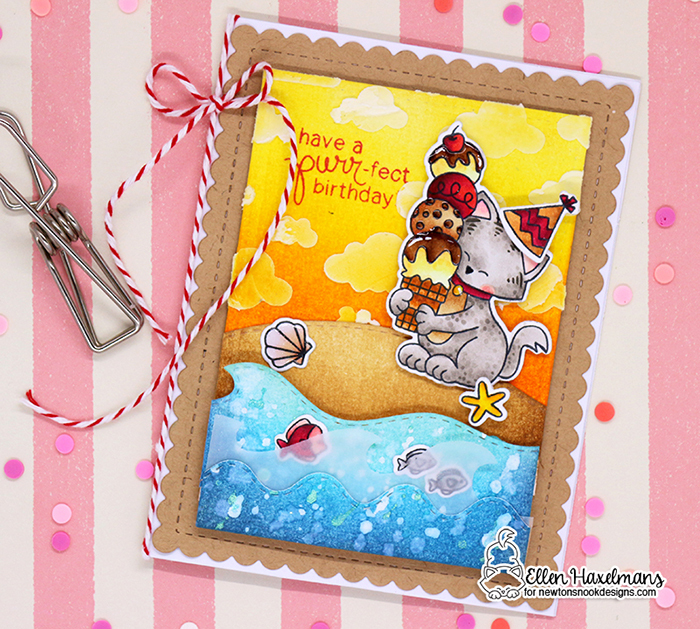 These summer themed cards are so adorable & fun! Love the bright colors you used on the Newton ice cream card! Love the scene of the cat having his ice cream on the beach. :) So cute! Wonderful cards! Beautiful compositions and so much depth and dimension. Oh, my sweet Ellen :-) Your cards with vibrant colors always make me happy! And your mad coloring skills never fail to amaze me! You make the happiest scenery cards! What fun cards! Love your color combos and the kraft paper! 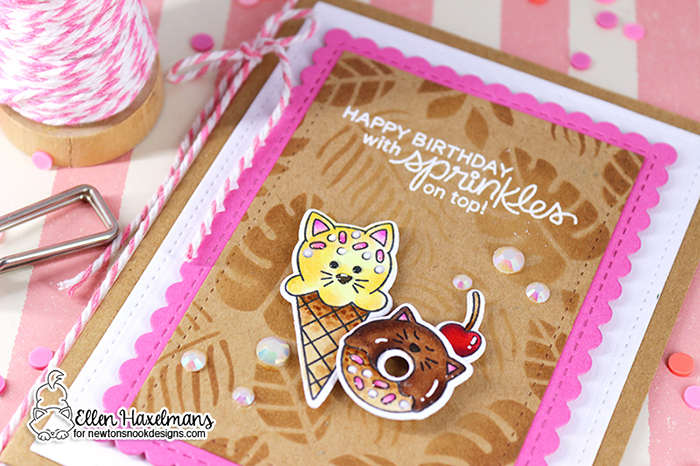 Fun dimension and details, and adorable stamps! What fun your cards are, great job! Just darling! Love the colors! Kitty at the beach better eat that ice cream cone quick before it melts! lol Super sweet cards and very creative with your beautiful scenes. Absolutley gorgeous! I always love your colourful cards! What amazing detail on these cards...that beach scene is awesome and love the watermark look with the shells. Sorry the watermark look of the leaves. Cute summer themed cards. I like the framing. Fun, fun birthday cards - my grandson loves them! Oooh, such fin cards! I love your beach scene! Oh my goodness !! I’m definitely in love with your two cards !! I love the joyful colds and designs along with the great definition they have. You did such an excellent job ! !